Status : private collection at owner's home. Zundapp was a famous german motorcycle manufacturer that produced only one aircraft engine late thirties. 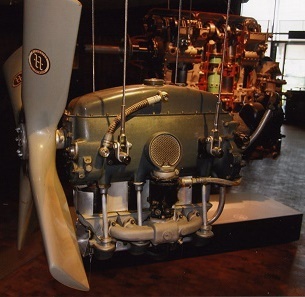 The Z9-092 was a low powered four cylinders inline engine that was fitted on trainers and liaison aircrafts used by the Lutwaffe during WWII. The French light aircraft builder René Leduc used it on his RL-16 and beat a world altitude record in the category of small aircraft under 500kg with 2 liters of displacement on 13 june 1949.